All prices are F.O.B. from our plant in Hammond, LA. 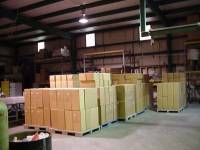 USA domestic packing (export packaging at extra charge). All shipments are insured at buyer's expense. Title and risk of loss shall pass to buyer on delivery to carrier at F.O.B. point. Henkel Enterprises, LLC is not responsible for delays after shipment is delivered to carrier. If goods are lost or damaged in transit, the delivering carrier is required by law to note damages on your freight bill. The carrier and not the shipper should be charged with all loss or damage. We are unable to file your claim for you but we will be happy to assist you in any way we can. Product design and price are subject to change at any time without notice. Prices acknowledged on "Hold for Release" orders are firm for 90 days from date of acknowledgement. If formal release for immediate shipment is not received within this period, order will be billed at prices in effect at the time of shipment. Fifty percent down payment with order and balance within 30 days of billing. The minimum order which will be accepted is $25.00 net. All acknowledged orders are subject to cancellation charge. Goods may be returned only with written permission of the manufacturer and will be subject to a 20% restocking charge. Return shipments must be sent prepaid. Henkel Enterprises, LLC warrants its products against defects in material workmanship. Henkel Enterprises, LLC will either repair or replace without charge any properly installed product which fails under normal operating conditions within one year from date of installation, provided it is returned to our factory, transportation prepaid, and our inspection determined it to be defective under terms of this warranty. The warranty covers only equipment manufactured by Henkel Enterprises, LLC, and does not extend to transportation, installation, or replacement charges at buyer's facility, nor does it apply to any other equipment of another manufacturer used in conjunction with Henkel Enterprises, LLC equipment. No other warranty, expressed or implied exists beyond that included in this statement.